My wife has four porcelain crowns across her upper front, and our dentist placed Lumineers over them, at a cost of around five thousand dollars. But they keep coming off. On three or four occasions at least one of the Lumineers has come off. The last time, while my wife is visiting her mother in another country, two of them came off. Is it a good idea to place Lumineers over existing porcelain crowns? We are disappointed and extremely disgusted with the Lumineers. 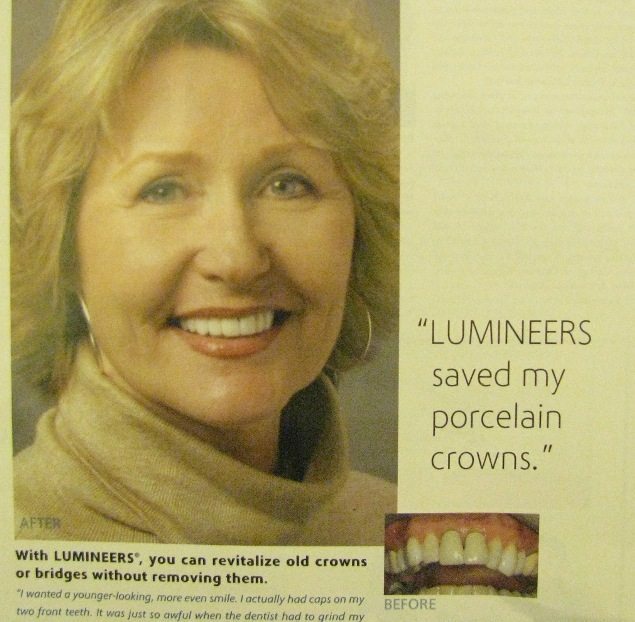 An ad from a dental journal, trying to tell dentists that it’s easy to bond Lumineers over crowns. This is advanced cosmetic dentistry, and doing it right requires specialized equipment and materials that most dentists don’t have, besides the fact that they haven’t been trained in doing it. The old porcelain has to be prepared, etched, and primed or the new porcelain won’t bond to it. Even when it’s done right, the results are mediocre at best. The bond between the old porcelain and the luting material tends to stain over time. And you’ll still have the metal foundation on the old crown that you have to deal with. When a crown begins to look dingy, it could be leaking and there could be decay starting underneath it. In that situation, it’s just good dentistry to take it off and clean it out. Dentists can often be surprised at what they find. Covering the situation with Lumineers will give a result that may not last very long before the whole thing needs to be replaced. Most expert cosmetic dentists will simply replace the old crowns with new all-ceramic crowns rather than cover them over with Lumineers or any other brand of porcelain veneers, because the cost and the amount of work is about the same, and because they want the final result to be beautiful, not just mediocre, and they want it to be sound and long-lasting. You paid $1250 per Lumineer. For about that fee, in Florida, you should have been able to get beautiful, new, all-ceramic crowns from a good cosmetic dentist. Anyway, it sound like your dentist almost knew how to do this. I’d go back to him or her and insist that he or she either replace these four Lumineers with new all-ceramic crowns (if he or she even knows how to do that), or pay you to go somewhere else and have this done. Thank you very much for your prompt reply Dr. Hall. I really appreciate it. My next step is to find a local dentist that will concur what you say. I either want the over $5,000.00 dollars back that I spent on these damn Lumineers, or new porcelain crowns. Or I am taking him to court. Find more information about Lumineers. How are they different from other brands of materials for smile makeovers? What is the difference between an expert cosmetic dentist and a general dentist? What about MAC veneers? I’ve seen ads that say that these are the best. Should I tell my dentist that this is the brand I want? See photographs of beautiful porcelain veneers done by expert cosmetic dentists from our referral network. Very few dentists can do work this beautiful. Find out how much porcelain veneers cost. We took a survey of costs from expert cosmetic dentists around the country and here we share the results with you. Find out about the cost of Lumineers. There is an awful smell coming from between my porcelain veneers. What is this? To return to the frequent questions page, click here. Read Dr. Hall’s blog posts about Lumineers, to read his answers to questions from site visitors. The bottom line: go to an expert cosmetic dentist for your Lumineers.